Behind Harbour Village are 3 closely grouped burial chambers set in a north-south line . All three monuments appear to have had a capstone partly earthbound and partly supported. 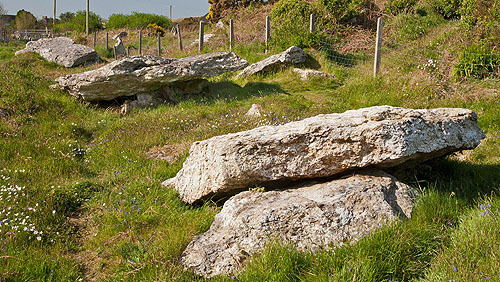 Carreg Samson is the most southerly , with the largest capstone (4.0m by 3.2m ), and there is a trace of a probable mound against its north side. As many as 9 Tombs were reported early in the 20th century , with many destroyed when Harbour Village / Harbour was built .